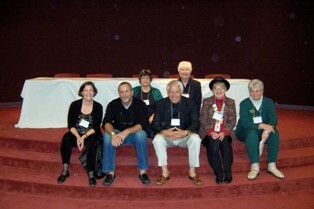 2011 inductee into the Arkansas Writers' Hall of Fame. 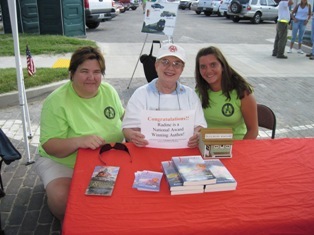 at the Frisco Festival in Rogers, AR, August 28, 2010. 2010 Silver Falchion Award from Killer Nashville. 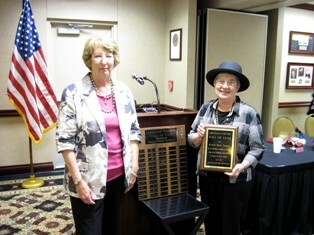 where she was inducted into the Arkansas Authors Hall of Fame. 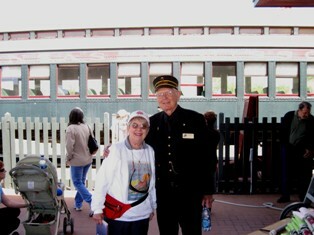 with a PBS crew filming for a 2011 television special, "Great Railway Journeys." JOURNEY TO DIE FOR, which was sold on the train. AND catching another historic means of transport. One group (re-enactors, thank goodness), waiting to meet the train in Van Buren. 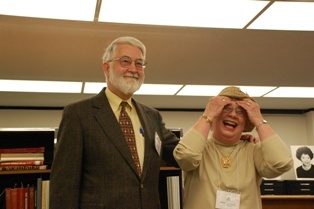 Carl Brookins, Anthony Rainone, Radine, Sue Senden. 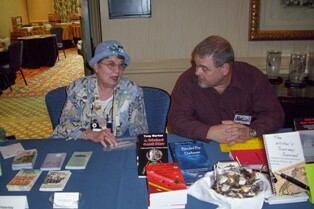 Books in Bloom festival at the Crescent Hotel in Eureka Springs, AR, May 16, 2010. A young customer with an important t-shirt. JOURNEY TO DIE FOR at National Train Day in Van Buren, Arkansas, on May 8th, 2010.
current researchers and future generations. 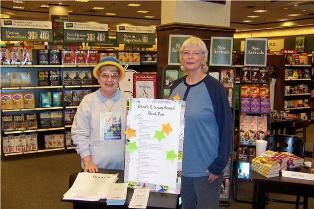 held at Barnes & Noble in Fayetteville, AR. 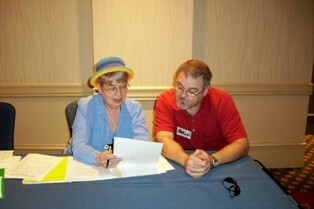 Weighty Discussion with Tony Burton at Killer Nashville, August 2009. 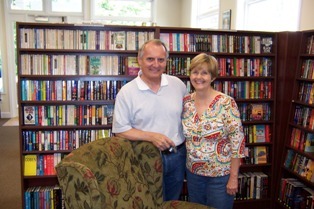 Mary and Greg Bruss, Proprietors, Mysteries and More. 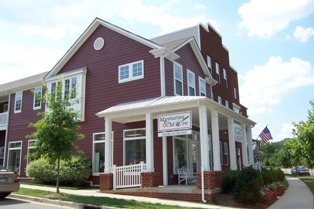 Mysteries and More bookstore in Nashville, TN. Summer 2009. 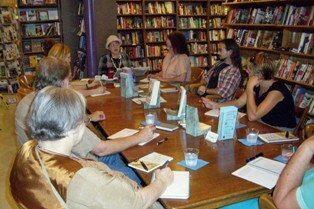 Workshop based on THE WRITER'S JOURNEY JOURNAL, Nightbird Books, Fayetteville, AR, spring 2009.
and signing party at I Love a Mystery bookstore in Kansas City. 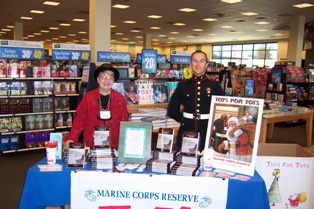 Toys for Tots event at Barnes & Noble, Fayetteville, AR. 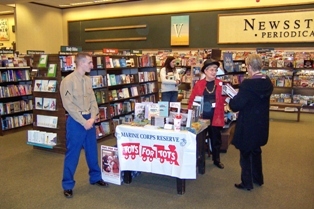 Toys for Tots event at Barnes & Noble, Rogers, AR. 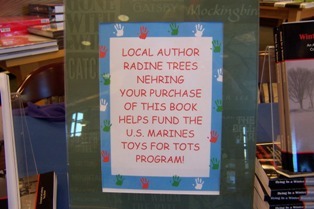 benefit the Marine Corps' fund drive on behalf of children in need. 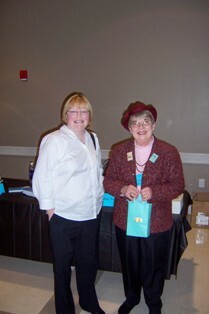 Radine with Margaret Fenton, organizer of "Murder in the Magic City," and author of Little Lamb Lost. 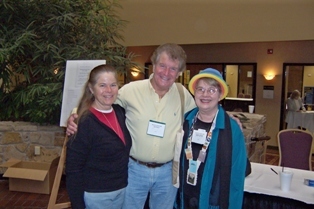 Linda Berry, Radine Trees Nehring, Kathleen Delaney. 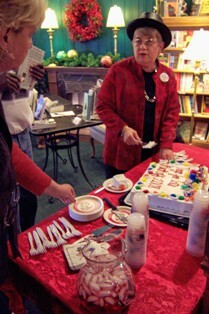 At a typical all-day book signing, T. Charleston and Sons Booksellers in Branson, Missouri. 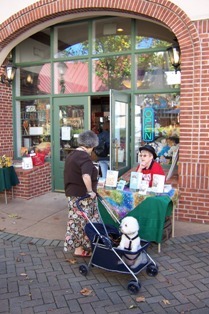 One interested book buyer..and one not. TV programs and is currently writing thrillers related to events in our time.